This past class we visited the FabLab down in the South Quad. After wandering my way over there and 3 failed attempts to get into the building, I was able to visit the FabLab for the first time ever. I have to say, it’s quite an eclectic place. There are so many projects you can work on, no matter what your interests. And I loved how it was open to the community and doesn’t focus on making profits. After touring the space and seeing all of the different stations – everything from screen printing, to fabric printing, to electronics – I got a better understanding of the purpose of the FabLab. I was very impressed by the space, and even more so by what people have come up with. I found the fabric station (and robotic-sewing machines) quite interesting. But I ended up spending most of my time in the Arduinos area with Colten Jackson as our instructor. Arduinos basically uses coding to get electronics to do what you want. We practiced by figuring out how to set up the wiring of the board and experimented with the coding. At first, we made a light switch on and off at whatever frequency we set it to. Then, we worked with a motor and were able to experiment with the frequency and degrees to which it would turn. Finally, we were able to play with touch sensors – so that depending on how hard we were touching a certain wire, the motor would respond based on the touch sensor. As someone who has never worked with electronics and has only gone as far in coding as HTML5, SQL, and SAS – I find Arduinos fascinating. I understand what we had worked on was elementary compared to what can really be done with the technology, but it’s meant to be that way to get younger kids interested in the technology at an early age. And I’m okay being at the same level as a 10 year old. I wanted to experiment on my own with the technology. I had tried to set it so that every time I had touched the sensor, not only would the motor go off but the light would as well. After multiple trial & errors, I sought help from my more experienced classmates. Turns out it’s not as simple as copying and pasting a single line of text and calling it a day. Both Toheeb and Elaine were able to help me out with this, and after a little experimentation my sensor was also able to produce light when I touched it as well as make the motor turn. Going forward, I’d like to work with Arduinos a little more to see what else the technology is capable of. Still not too certain about my semester project, but I am open to the idea of working with Arduinos again in the near future. This entry was posted in Reflections, Week6 by Paige Lee. Bookmark the permalink. Your experience with arduinos only serves to further my excitement for tomorrow’s class session. Like you, I don’t have that much experience with coding apart from some basic competency in Python, Ruby, and SQL. I’m hoping to apply some new coding knowledge and thus create some applications in hardware. Wow the Arduino workshop looks awesome! That led/servo switch with the resistance sensing when you touch is amazing. Im impressed that that was possible in just the first day! 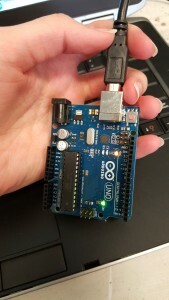 Arduinos is a very interesting platform to make hardware work, but it makes people who do not know coding feel frustrated in the first place. The good thing is that we have some talented experts in the classroom who have had relevant experience to help other people solve problems. I really like the working and collaboration environment in this class!